The time has come for your submissions to come in! Theres only a week or two left before we have to stop taking any more in. Thanks to everyone who has already submitted, this year is lookin’ good! We will be having meetings on Mondays at 3 o’clock in the 5.1 room in the library building’s first floor. The ESMP group is coming together and will soon be announcing the date/time/location of their weekly meetings. Stay tuned! After receiving nearly 30 songs and much debate between the board members, we have selected the 19 tracks for the 2015-2016 Evergreen Student Media Project album. 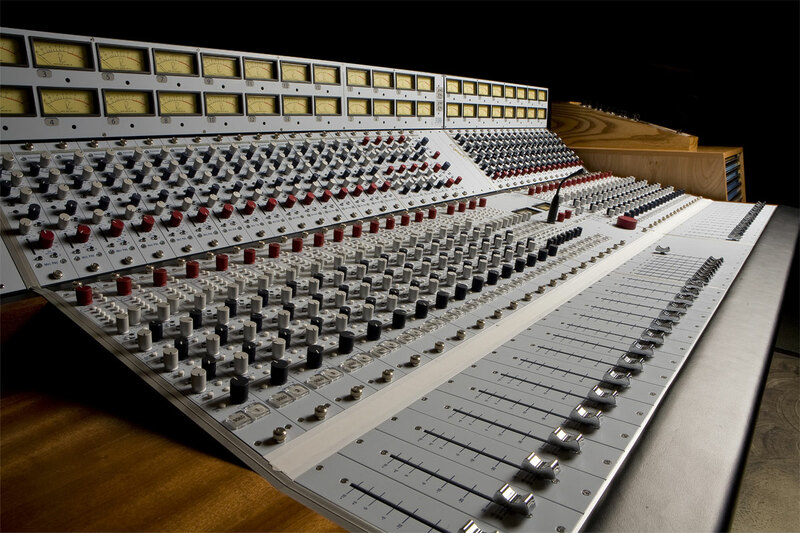 All artists will be contacted shortly, those selected for the album will be receiving calls or emails from an Audio Engineer to set up time in the Advanced Multi-Track Studio to record your song. Those who did not get selected for the album will still have there songs featured on the USB if they desire. Thank you all for your submissions, looking forward to hearing the progress as the album comes together! We will be hosting another ESMP meeting in CAB 301 from noon till 1 if you are interested. We will be listening to our newest submissions, probably a few of the others as well and making a decision on which songs will be on this years album. So come out and let your voice be heard. We will be holding a follow up meeting on Thursday November 19th at noon, this time in the CAB, room 301. These meetings are open to ALL Evergreen students…hope to see you there. We will be holding our first meeting of the year as a group this Thursday, November 12th, at noon down in the 5.1 room (Lib 1328). 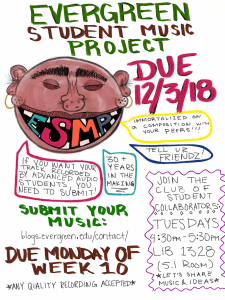 We will be discussing a few topics, primarily what format do we want to distribute this years album on (CD/vinyl record/tape/USB) and forming sub committees to help spread the word on what the Evergreen Student Media Project is all about. If you are interested in attending or want to be involved in some way, please stop in and see us. 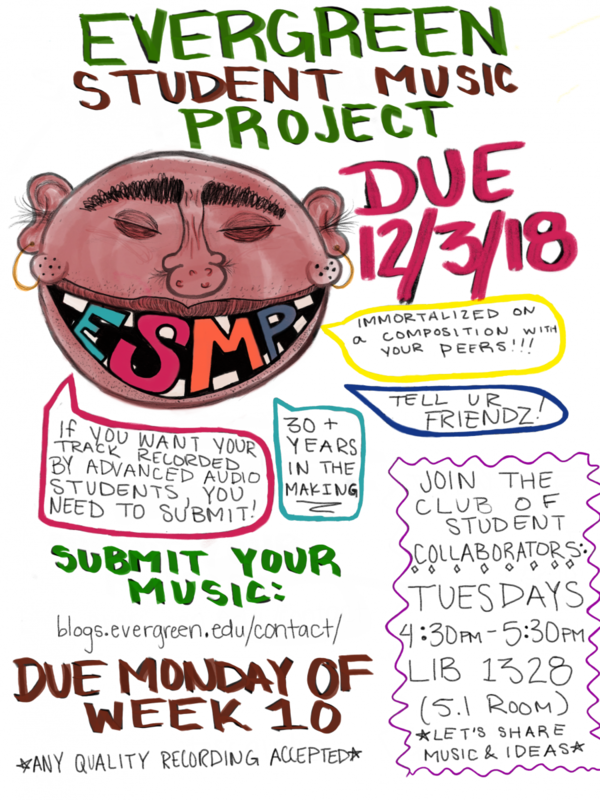 We are now accepting submissions for this year’s ESMP! Go to the SUBMIT page on this blog to submit your own original musical demo (lo-fi demos are O.K.). We also have a Soundcloud page that you can SEND A MESSAGE to with your music (soundcloud.com/esmp-2016). At least one member of each band must be a currently-enrolled Evergreen student. After submissions have been gone through, we will contact the artists and set you up with a student from the Advanced Multi-track class who will re-record the chosen song in our fabulous campus studios. The Multi-track Studio that was recently renovated now has a 32-channel Neve mixer that will make you drool! Sounds AMAZING! Have your music pressed to CD and archived on the internet! What more could you want?! (don’t answer that). SUBMISSIONS ARE DUE BY WEEK 10 OF FALL QUARTER.